First time taking dance lessons? Click here. Here are some things it’s helpful to know before your first dance class. You can also check out our What is Swing? page for additional information. A style of Jazz music, originating in the 1930s with the Big Bands of the Harlem Ballrooms, characterized by a swinging, or syncopated rhythm. Also, dances that are performed to this music. Lindy hop is the original partnered Swing dance, and many dances have evolved out of it, as the music has changed, and as the dances have moved around to different geographic regions and picked up different influences. Jitterbug, Jive, Rock & Roll, Boogie Woogie, West Coast Swing are all off-shoots of Lindy hop. At Rhythm City, we are devoted to Lindy hop and related Vintage Jazz dances, such as group solo dances that were performed socially at ballrooms in the 1930s, 40s, and 50s, and continue to be studied and danced today, worldwide. The member of a partnered dance who determines the moves danced at any given time. The lead initiates the momentum, direction, and flow of the movement of the dance. The member of a partnered dance who waits for the direction of the lead, and then executes the move or movement that has been led. The follow dances the moves determined by the lead, but may do so in their own particular way, using their own style and flair. What happens in most dance classes, where leads and follows change partners every few times we try a move, so that every follow dances with every lead. This is the best way to improve your connection (lead and follow) skills, as you learn a lot from how different partners lead or follow, and how different partners respond to your execution of a move. About half of the people registering for Swing 1 classes sign up alone; some sign up with a friend who dances the same role (i.e., two follows signing up together), and some sign up with a partner. Whether you come alone or with a friend or partner, we recommend rotating in every class to avoid picking up and cementing the habits you develop dancing with just one person. We advocate rotating in our beginner classes, because it is a helpful learning tool, and because it helps to establish and nurture a community of positive students sharing in a group learning environment. 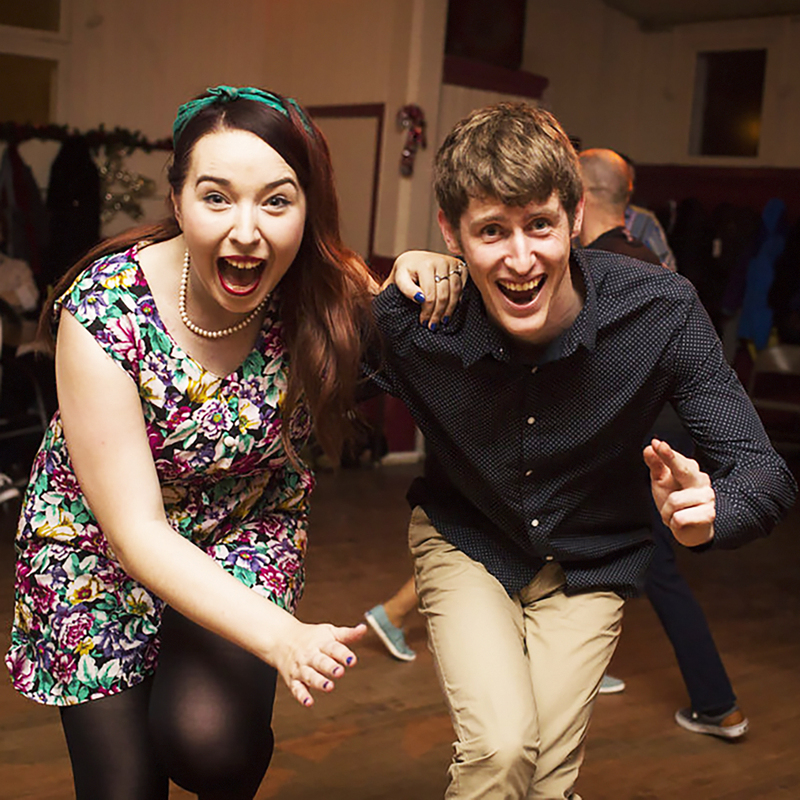 Our priority is a community of Swing dancers who mix, mingle, and participate in a joyful dance scene. For questions about levels, history of the dance, what to wear, and what music to get, see our What is Swing? page. Beginning Swing Lessons are designed to get you out on the dance floor and having fun immediately. The Thursday Swing 1 class is followed by the weekly swing dance, Rhythm City Strut. It's free for Swing 1 and 2 students! Each series is 6 weeks of 1 hr classes. Subscribe to our youtube channel for practice/review/recap videos. Note: We advocate rotating in our beginner classes, because it is a helpful learning tool, and because it helps to establish and nurture a community of positive students sharing in a group learning environment. Our priority is a community of Swing dancers who mix, mingle, and participate in a joyful dance scene. See also First time taking dance lessons? link above for more discussion of the benefits of mixing in social dance settings and lots more useful info. Intro to Swing students enjoy free admission to the weekly dance, Rhythm City Strut. Get started in the wonderful world of swing dancing! There’s nothing like moving in rhythm with a partner. If you’ve always wanted to try but were afraid you’d have two left feet, these are the classes for you. Super basic and easy-going, learn to dance in a friendly, supportive environment. Meet new people, get moving, improve your co-ordination, and have a lot of fun! We start with an introduction to partner dance technique and 8-count swing dance basic steps, and we put them together so you can enjoy the dance and the music with any partner! No partner required to register or attend. If you missed out on joining a series and want to get started right away, join us March 30 & 31 for the next Beginner Swing Weekend! Info and register here. We review the material from Swing 1, introduce the 6-count basic and Charleston: a predecessor to Lindy hop, the Charleston survives as a versatile figure that has many variations. We’ll practice the step, as well as mix it in with the patterns you’ve already learned. and spend lots of time practicing both the 8-count and 6-count basic steps (both widely and indiscriminately used by Lindy hoppers in their social dancing). We add patterns that give you a greater vocabulary of moves for your social dancing, as well as a deeper understanding of how the partnership works. Pre-requisite: Swing 1 or equivalent. You should be comfortable with the 8-count basic and a few moves using that basic. Some students choose to take Swing 1 & 2 simultaneously; we recommend this only if you have previous dance experience. ... Stay tuned for more lessons throughout the spring and summer! Search all upcoming classes here! The Swing dancers are coming to get you. Photo by Chris Loh.